The #1 reason for patient dissatisfaction with a previous bunion surgery in my practice is an under-corrected bunion deformity. Not all bunions are created equal! Each patient requires a procedure specific to their deformity. There is not one procedure for all bunions. Unfortunately, many surgeons fix every bunion with the same or similar procedure. There are dozens of ways to fix a bunion, and one procedure cannot fix all deformities as every patient’s deformity is unique. 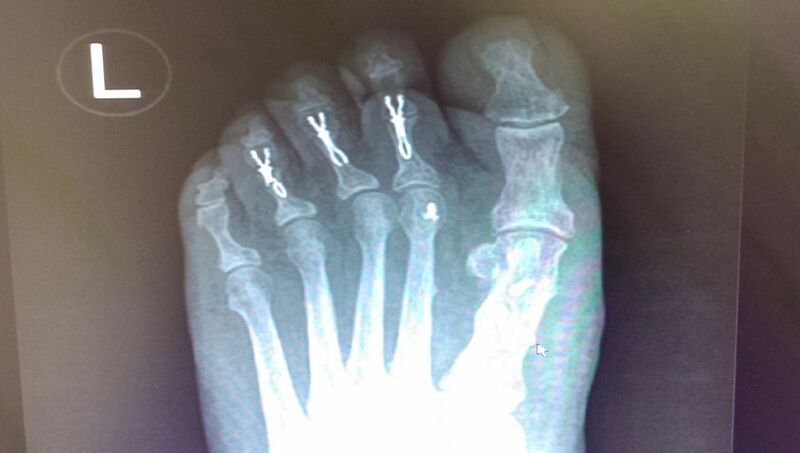 Most bunion surgeries require an osteotomy, or surgical bone break to correct the deformity. Two screws are often used to maintain this correction. For larger bunions, the osteotomy choice changes, and in the most severe cases a fusion of the joint, called the first tarsometatarsal articulation, may be required. This removes the angular deformity and still allows normal physical activity after healing. Painful 2nd toe joint – the bunion is corrected but the ball of foot behind the 2nd toe hurts. This occurs when the bunion procedure shortens the long metatarsal bone too much behind the two bones in your great toe and leads to increased pressure to 2nd toe joint. In some cases the shortened 1st metatarsal bone needs to be elongated with a bone graft with a metal plate and screws. Images show appearance of left foot where the first metatarsal bone behind the two bones of great toe was shortened during bunion procedure. This can cause pain in the second metatarsal head (the bone in image behind 2nd toe). Failed attempt at joint fusion – if the initial treatment choice was to fuse great toe joint or fuse the joint at base of first metatarsal, delayed healing or a nonunion can occur. Nonunion refers to a joint that did not heal to the adjacent bone. This list in no way encompasses all the treatment options for revision of a painful bunion surgery outcome. Remember, every bunion is different, and requires special evaluation of patient history, x-rays, and a physical exam. Part three of bunion revision surgery series will discuss recovery.